This year I wanted to make something special for Christmas and this has turned out to be one of my very favorite Christmas decorations. It was not really that hard but it was a little more challenging then I thought it would be. I think it was just a little more difficult because of the size of the print. Seriously, How pretty it is!?!! It makes such a big impact! Let me tell you exactly how I did it. 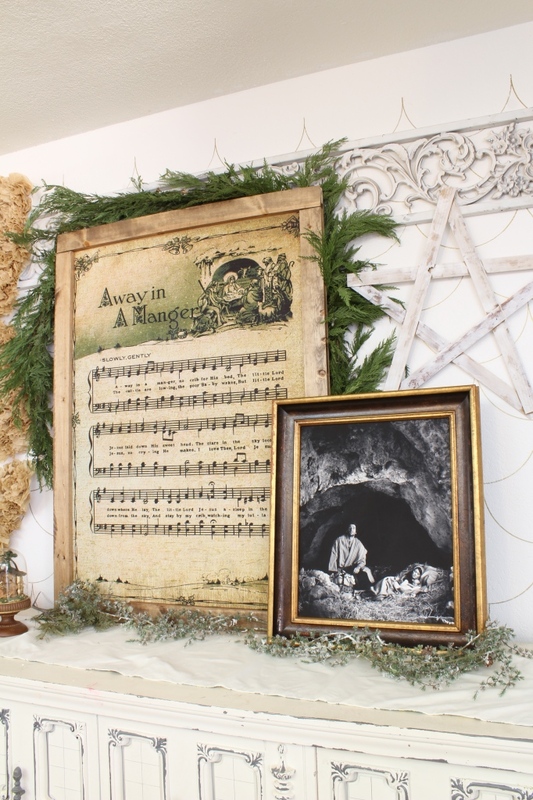 I found the “Away in a Manger” print online and I sent it over to Staples to get it printed. I had to resend this print over twice. The first time the quality was really really bad. But after I found the image that was 2400 pixels it was so much better. So the higher the resolution the better it will be. I got the print done in black and white at first and it was fine but the color turned out way better. It was about $24 for the 36×48 in colored. I got a really thin piece of wood from Home Depot and I had the kind souls there cut it down to a 36×48 size. Then I got two pieces of 1×3 trim. I also used Mod Podge for paper and the Plaid Mod Podge Decoupage Tool Set and this little set was a game changer for me. It made a big difference. What I did was I started at the top of the board and I painted on about 1 foot of Mod Podge right on the board and I lined up the print to make sure that it was even. (We marked around the board so we just had to line up the page with the outline that we made around the board) then I worked down the page another foot or so. I continued to work down the board until I was done. Work fast but smart. DO NOT move the paper around to much and also don’t use to much mod podge because the paper will rip. Try to keep your hands clean without to much mod podge because we did have to patch up a few spots. I realized that with this project the key is to try your best to not take too long. Once the mod podge starts to dry its really hard to move the paper around with out ripping it. After you put the paper down use the roller to work out some of the bubbles. For the frame out I did the same thing that I did on the instagram board. 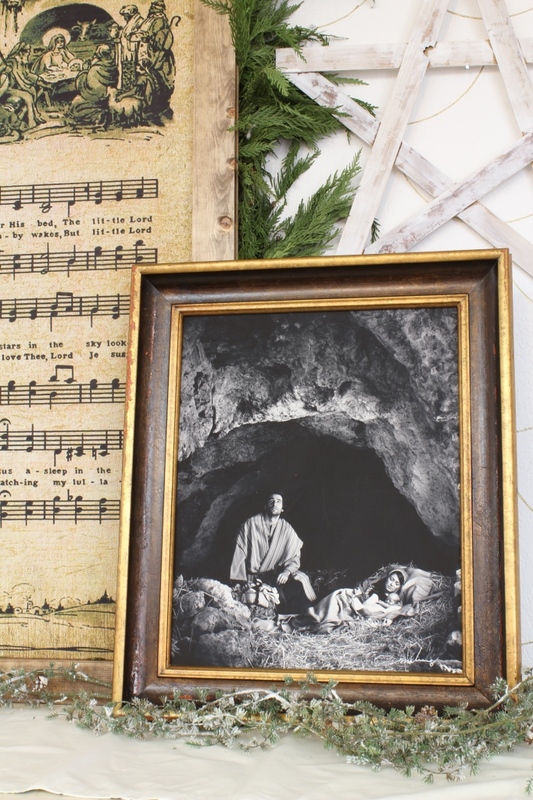 I also wanted to talk a bit about the amazing Nativity Picture! I am so luck to know the talented Mark Mabry and he did the amazing job on this picture. It is a print I will always cherish. He captured so much emotion in this print. Words can’t express how much I love his work. I have THIS large print hanging in front room and I love it. It brings so much joy and peace. Check out his work. Last year I did these “JOY Coffee Filter letters” and I am glad I found a perfect place for them this year. I got the little wooden nativity at home goods for only $24 it was the perfect addition to my little collection. This is a project that could be used with any print. As long as the print quality is good. I really do love this piece of DIY Art. I am planning on doing this again with an image that can be up year round. What do you think about this DIY Art Piece? I LOVE this! 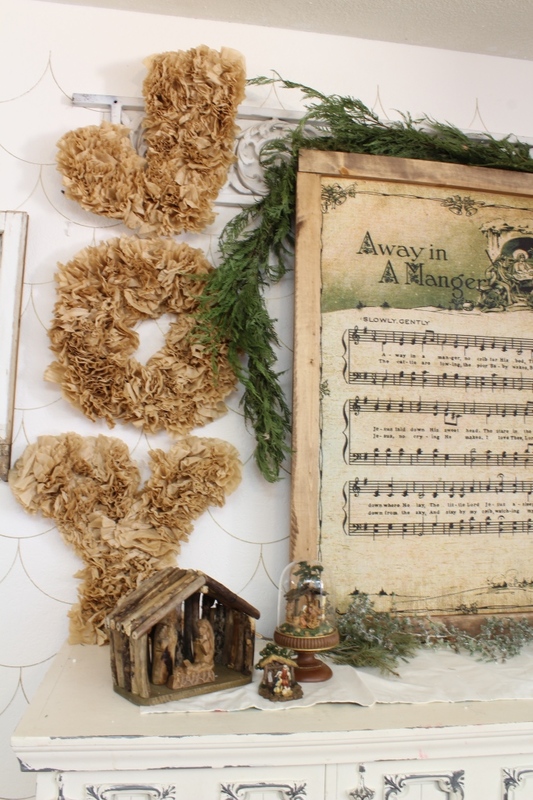 Beautiful vintage sheet music, and the framing idea is so pretty. Pinned and shared on my FB page! You have something that most likely nobody else will have, outstanding and so very special. The black white photo is wonderful also. You’re so right about the emotions in the photo. You did great job framing it, the rough texture of frame matches the sign/song. You are very clever how you framed it and size you had it printed at. Glad you shared this. 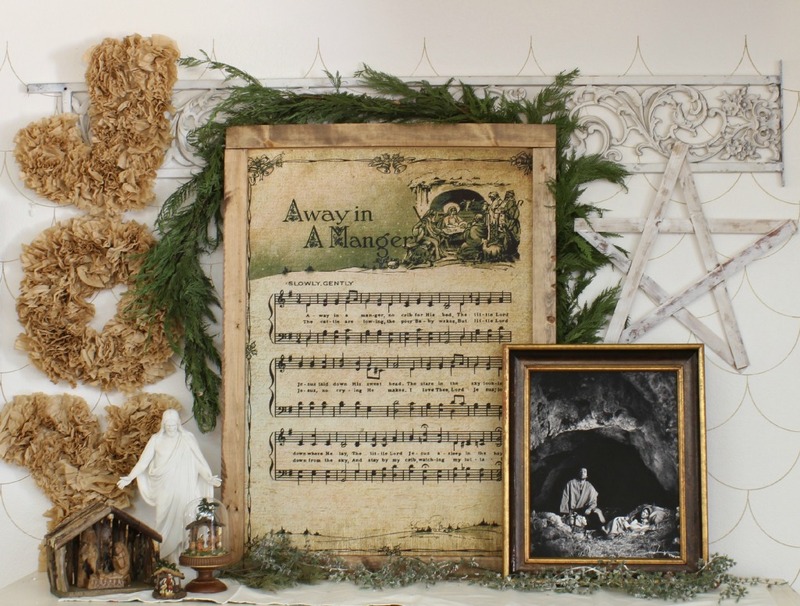 Have seen so many excellent decorating ideas, it’s just fantastic the imaginations bloggers have.